My initial reaction to the idea of pool on a computer was that it would be awfully hard to do well. Pool, I thought, would be too much of a physical game to run on a micro. IDSI has proven me wrong with the release of Pool 1.5 for the Atari. The first nice feature that Pool 1.5 provides was revealed to me when I left my Basic cartridge in the computer and tried to load the program. A message appeared on the screen saying REMOVE CARTRIDGE. That was a refreshing change from BOOT ERROR. After removing Basic, the program loaded quickly. The first screen shows the pool table and a prompt for the number of players (1-4). There is also a Demo mode which demonstrates the action of the balls during play. The computer does not play pool with people, but all of the four games can be played alone. The players then enter their names, and decide which game is to be played. The game keeps track of whose turn it is by name and, in 8-Ball, will tell you who has solids and who has stripes. You can choose from Straight Pool, 8-Ball, Rotation or 9-Ball. The rules of each game are kept simple to allow for individual variations in play. The only difference I found in the rules was in 9-Ball. 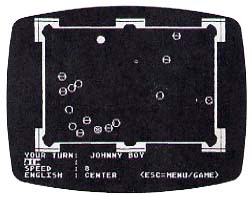 The program returns the 9 ball to the table when it is sunk out of turn. When I play Uncle John in southern Maryland, the rule is that sinking the 9-ball using a proper combination is the end of the game. I have lost many quarters to Uncle John because of that rule, so I remember it well. The play of the other three games is pretty much the way I was taught. The game is played with either the keyboard or the paddle controllers. The cue ball appears as a white ball on a red surface with a dotted line extending from it to a "ghost" ball which represents the point of impact for the cue. Rotating the paddle moves the ghost ball and provides coarse aiming at 128 different locations around the cue. Pressing the A key at this point allows fine aiming at a resolution of 32 positions to either side of the selected coarse position. Aiming is only one of three parameters to be chosen, however. Pressing the space bar will bring you to the speed selection, where a 1 is a light tap and an 8 is an extremely hard shot. Pressing the space bar again switches down to the english selection. Using the paddle, you choose from top, bottom, center, left or right and combinations thereof. Pressing the paddle fire button shoots the ball. This can be done at any time, with the speed and english defaulting to your last selections. When the shot is off, the realism begins. The balls make a pleasant clicking sound as they hit each other, and a sunk ball makes kind of a gulping noise, as if it had been eaten. The physics of collision have been reproduced very well, and shots must be aimed and hit properly. In the case of a scratch, the cue is returned for positioning. The program questions the user if any balls sunk during the scratch are to be returned, allowing for individual tailoring of the rules. There are several key-selected features in Pool 1.5. A favorite of mine is the Repeat Shot. Pressing the R key will restore the table to its last condition and allow you to change the angle or speed or english and try again. In several games with one of my cats, I've found this feature great for cheating. He doesn't know the difference. The balls appear either as stripes and solids, or with their numbers showing. The C (color) key allows the user to choose between these two options. The ESC key toggles between the game table and the menu/scoreboard. The scores for all players are kept here, and is updated each game so that a tournament of many games is possible. Other user-controlled functions include setting the table friction and the motion or speed at which the balls interact. The keyboard commands are a little tough to master, and setting up a shot can require quite a few keystrokes. It takes several trips between the paddles and the keyboard before you can shoot. Although the high resolution part of the hi-res graphics is excellent, I find the uniform background and table color of red to be unattractive. Perhaps a later release of Pool 1.5 will include a set-up feature to permit trick shots. But overall, the reproduction of the game of pool is accurate and fun. It is a relaxing and enjoyable game.